Minnesota halfback Robert Smith has long been an annoyance on the field for NFC Central rivals Chicago and Green Bay. This off-season, he became a greater annoyance off the field. The Bears and Packers do not have their 1,000-yard rushers of a year ago under contract and Smith is as much to blame as anyone - blame that can be traced to the five-year, $25 million deal he signed with the Vikings in March. "The Robert Smith contract helped every other running back in the NFL by raising the standard," said Neil Cornrich, Smith's agent. That was supposed to include Raymont Harris, who rushed for 1,033 yards for the Bears last season, and Dorsey Levens, who rushed for 1,435 yards for the Packers. Having played out their contracts in 1997, they envisioned Robert Smith-type money this off-season, too - but it was money their clubs were unwilling to pay. The fallout is that Harris has now replaced Levens in the Green Bay backfield. Blame - or credit - the Smith contract. Most NFL teams considered it excessive. They argue that Smith's contract didn't raise the standard for running backs, it lowered it. His contract told players you don't have to be a Barry Sanders or an Emmitt Smith to receive $5 million per year. The Vikings are paying Smith elite money without him ever having achieved elite status. He has never been to a Pro Bowl in his five seasons. Smith's productivity has been spotty. He has only 12 100-yard rushing games and 18 touchdowns in his five-year career. Elite backs such as Sanders have had more 100-yard games in a single season (14 in 1997) and Emmitt Smith more touchdowns (25 in 1995). Robert Smith's participation also has been spotty. He has missed almost as many games in his career as he has started . He has never lasted a 16-game season, missing time with the chicken pox, an ear infection and assorted ankle, knee and hip injuries. Smith, in fact, rushed for 1,000 yards for the first time in his career in 1997. Also rushing for 1,000 in 1997 for the first time in their careers were Harris and Levens. Levens outperformed Smith at individual and team levels. He went to the Pro Bowl and his Packers went to the Super Bowl. In his opinion, he's worth more than Smith. And that's what he's reportedly been seeking - a long-term contract averaging about $5.3 million per year. The Packers slapped the franchise tag on Levens. That guaranteed him a one-year contract at an average salary of the NFL's five highest-paid running backs. But that's only $2.74 million, a little more than half of what he's asking. With negotiations at a standstill - and needing a running back to defend their NFC championship - the Packers signed Harris on Friday on the eve of training camp. Harris was an interesting tale himself. The Bears placed the transition tag on him in February. That guaranteed him a one-year contract at an average salary of the NFL's 10 highest-paid running backs. But that was only $2.46 million. Harris, who also has a history of injuries and also is represented by Cornrich, wanted a multi-year contract from the Bears reportedly in the range of $3.2 million per season. Chicago offered him a one-year deal at $2.85 million in April, but Harris turned it down. So Chicago drafted Penn State halfback Curtis Enis in the first round and removed the tag on Harris. That allowed him to sign with anyone. But at that late date, with NFL rosters filled and most dollars spent, Harris didn't draw much interest. Only the Packers and Miami Dolphins brought him in for visits, and neither was offering Chicago money. So Harris is now with the Packers at a bargain price, and Levens is in limbo. Smith may prove to be worth his money. He has always had great size (6-2, 212) and speed (4.3 40 time). 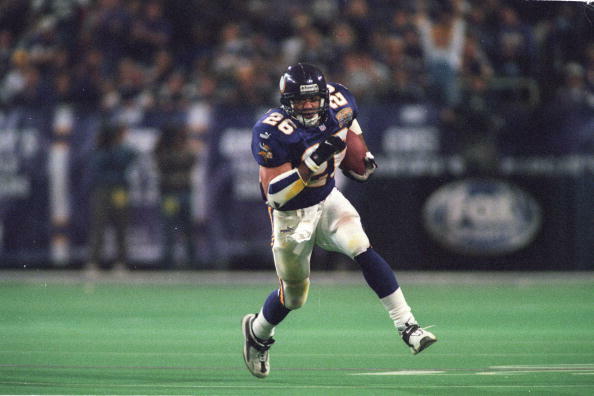 He finally gave the Vikings a snapshot of greatness in 1997, when he averaged 5.5 yards per carry and unleashed a 169-yard game on Buffalo. He rushed for 1,266 yards despite missing two games with injuries. If he stays healthy, Smith could compete for future rushing titles. "Football has always been a game based on expectations," said Cornrich, defending the investment by the Vikings.